How far will you make him fly?! Rocketman was one of the first game engines added to What2Learn but it has undergone a fantastic makeover and boasts great graphics, a scrolling 3D environment and improved game play. It is quick and simple for you to make your own learning games using this game engine so make one today! The game is one of only a few at What2Learn that adds a real sense of time pressure for students playing the game. The longer they take to answer questions the more power drains away from the cannon. 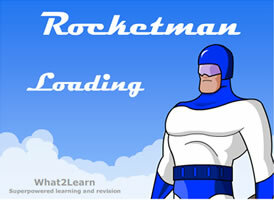 Answer the questions accurately and quickly to maintain full power and blast rocketman a huge distance. With great cartoon graphics and a real sense of urgency generated with time passing this is a game that your students will love to use to enhance their learning. All you need to do to make your own rocketman quiz game is supply a game title, eight questions and eight one word answers. Alternatively, why not pick from our wide range of other game engines – they are all quick and easy to use. Quizzes, interactive wordsearches, even zombie-boxing games for your students are all ready for you to supply the questions and answers to. You can even embed the completed games into your own blog, VLE or website. Alternatively you can add your games to W2L to enable you to track the progress of your students through your games – a great way to reduce your marking!